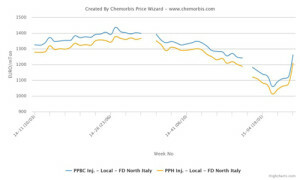 After the March propylene contracts settled up €105/ton late last week, initial PP prices have started to emerge with three-digit hikes in Europe as per ChemOrbis pricing service. Citing supply constraints in addition to firmer feedstock costs, PP sellers are aiming for increases larger than the monomer gains at the beginning of the month. 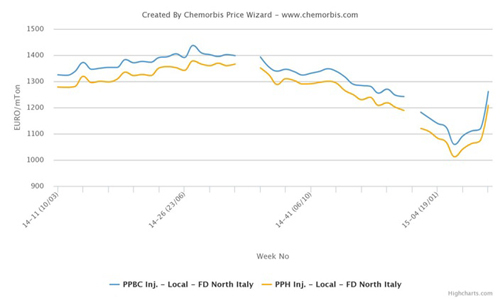 In Italy, a distributor reported raising his West European PP prices by €130/ton for March citing his short supply after skipping increases in the second half of February. Another distributor started giving initial March PP offers with sharp hikes of €150/ton from his latest February levels and added that his West European supplier is holding short stocks, especially for copolymers. However, the seller did not exclude the possibility of slight adjustment in the upcoming days. A different distributor, who also elected to issue hikes of €150/ton for March, commented, “The market levels are likely to settle in the upcoming days while we are confident about obtaining hikes larger than the monomer gains given tight supply.” A converter reported receiving initial March PP offers with hikes between €130-150/ton from West European producers when compared to early February when he made some purchases at levels below €1000/ton for both homo-PP and copolymers. The buyer said that he is planning to wait until the second half of the month before committing to fresh purchases. In France, a distributor issued hikes of €100-125/ton on his March PP prices in line with his West European PP supplier’s guidelines. The seller reported hearing hikes of €125/ton from other European producers. A converter received initial March PP offers €130-140/ton above his done deals in the first week of February. Another distributor in Belgium also reported giving March PP offers with increases of €130/ton from February and confirmed reports of short availability, according to ChemOrbis.